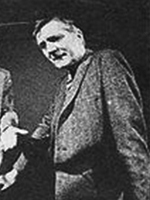 Roger Baron also appeared in Himan Brown's 1977-78 radio program for young people, "The General Mills Radio Adventure Theater". Roger Baron was born on November 22, 1946 in Chicago, Illinois, USA. He is an actor, known for The Yum Yum Girls (1976). He was nominated for a 1972 Joseph Jefferson Award for Best Actor in a Supporting Role for his performance in "Child's Play" at the Candelight Forum Theatre in Chicago, Illinois.